Large hotel rooms, family suites, and a hostel are included, for budgets from affordable to luxury. The price range of each hotel is indicated by the “$” symbol. Please see the $-symbol key in the sidebar for comparison. Click on the hotel name for more specific details about each hotel for families. Information includes amenities, contact links, a location map, and tips on how to book. All locations have private bathrooms (ensuite) unless otherwise mentioned. 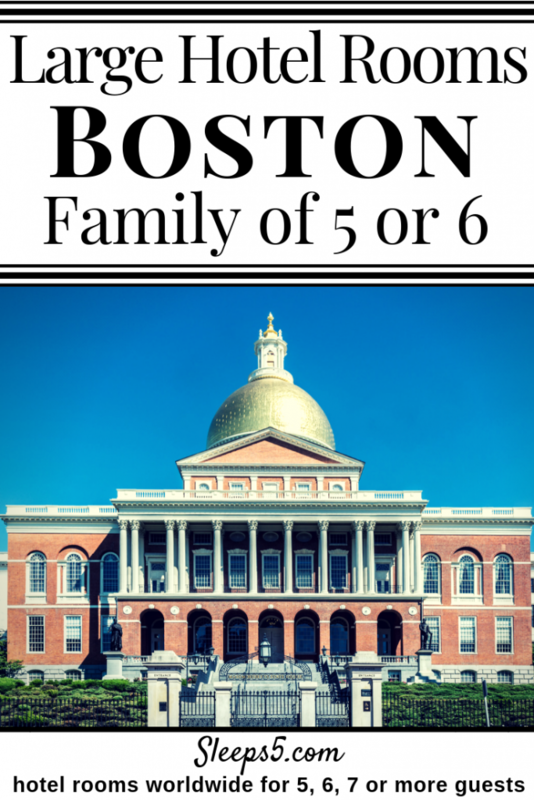 We hope you’re able to find the best place to stay in Boston with kids! See the Sleeps5 menu for other United States cities. For the east coast, it includes Orlando family hotels for 5, 6, or 7, Philadelphia hotel family rooms for 5 or 6, and family friendly Washington DC hotels. Boston’s sites for celebrating black history.